An insult does not go unnoticed. We all make choices as of whom we want to see. Personally I don’t have a lifetime of magic medicine to try. Real medication and real doctors for real disease. Absolutely, Kati. Everybody gets to make their own choices. But it is the patient community that has been insulted, and not by me, but by pretty much the entire medical community. Neglected and abused for decades. These aggressive and dangerous intravenous medications are only palliative also, like the gentle things I am advocating. Rituxan, in particular, scares me for these patients. The immunological abnormalities are not yet understood well enough in the disease. It seems a potentially very destructive choice to me, even though there will be people who improve. The downside is too great. It kills people! Russian roulette. I’m sorry if my comment upset you, because you are pursuing one of these paths, but it is my considered medical opinion. If I die from this treatment- so be it. I made a very well informed choice for myself and I am comfortable with that. I know the risks, and I know the benefits. I have read the Fluge et al paper. I have professional experience with RItuximab. I have watched Fluge and Mella presentation from Invest in ME. I have talked with patients from Norway that have gone through the treatments. It is not for everyone. I know that for sure. Some other patients opted for Ampligen. And some other opt for very restricted diet, 2 or 20 handfuls of supplements (spending thousands of dollars) and alternative therapy. Their choice. Not mine. Rituximab is covered for me, from patient assistance at Genentech. I am forever grateful to them and gladly give them all of my B-cells. They ain’t working. And I am forever thankful for the Peterson, Kogelnik and the likes for offering these drugs to patients, and also organizing clinical trials- so we can actually tell for sure if it’s working or not. And for presenting and attending conferences like Invest in ME and IACFSME. Only through evidence based medicine can we move forward. I am fed up with people wanting to cure us with fringe treatments. This in my opinion is not what we need. Real treatments. Real medicine. I have never used the word “cure”. The treatments I am discussing reduce suffering and are quality of life enhancing, with or without Rituxan. If my ideas, knowledge and experience don’t interest you, that’s fine. No need to be insulting. Good luck to you. And of course antiretrovirals are on the table for my patients, if you were implying they aren’t. I have one patient on Viread and two considering it. I consider all options with my patients. I just have a strong bias against treatments that can kill. Well in fact I quoted you insulting physicians who have spent a lifetime taking care of us. While it is not necessary to make friends with these colleagues, at least giving them some respect would be good. I seem to have touched a nerve here, and prefer not to engage any further. If you have decided to go this route, I leave you to your own decision and wish you the best of luck. I’m truly sorry that you can’t see the wisdom in the simple, gentle modalities I am discussing. Please do not be discouraged by some unfortunate thoughtless posts. Maturity requires measured thoughts and comments. This is a lesson that many have yet to sufficiently learn. Your courageous, difficult, sincere, and meticulous efforts of your blog are literally saving lives and the quality of them. Thank you and keep up the good work! I agree with Gk. Kati if you don’t like Dr Jamie’s approach you are free to go elsewhere. There are plenty of us who do like her common sense “first do no harm” approach. Calling these treatments “fringe” is an insult to all the patients who have been completely abandoned by mainstream medicine, whether it is the autistic community, the Lyme community or the ME community. Katie if you’re so happy with your treatment and the treating doctors, why do you feel the need to come on here and say any of this, and make personal attacks on Dr Jamie who is sick herself and only trying to help people. It’s none of your business what treatment she is undergoing. What an inappropriate comment and nasty. You’re way out of line and don’t know boundaries. Attacking another ill person is wrong. Plenty of us are suffering, yet we don’t vent our spleen on others to feel better or feel one up. FYI my ME Spcecialist in Australia who has seen well over 5000 people with ME shares exactly the same thoughts as Dr Jamie on Rituximab, he said it’s great it’s been discovered but people have died from it. It’s not for me or people with ME BUT he said just wait, from this drug, better drugs will now follow. It’s discovery was a great thing. Personally I think you’re angry the Rituximab isn’t working for you and are displacing and projecting your anger on Dr Jamie. It’s understandable if you’re angry that your treament hasn’t worked so far, but please don’t direct your anger where it doesn’t belong. Own it, even if it’s hard to. I wish you the best. Well Kati, let us know how well you were helped you out in about 25 years, and also the cost involved with all the treatments. Most of us have been in it awhile now. We already know. Bye bye. I’m very interested in what you have written, I was just wondering do you test the oxygen status of the individual patient or are you treating blindly? This isn’t meant as inflammatory just a query. I’m presuming you check so forgive me if it sounds naive. And use the search feature in the header. The safe use of hyperoxia, even under pressure, has been very well worked out by the diving industry, without the use of tissue oximetry. Scuba divers are routinely exposed to higher doses of oxygen, in Nitrox, than are used in clinical practice for brain injury. They are exposed repetitively for many years, and oxygen toxicity is more likely while exercising than at rest. The doses attainable with a concentrator are safe to experiment with, in my opinion. And unlike drugs, it goes away in minutes if you turn it off. Again, we are not trying only to replace to a “normal” level of cellular oxygenation, which varies from tissue to tissue (and, in our case, I suspect moment to moment) anyway. Even if you could somehow do this, it would require wearing it all the time. Rather we are trying to hyperoxygenate for a prescribed period of time. 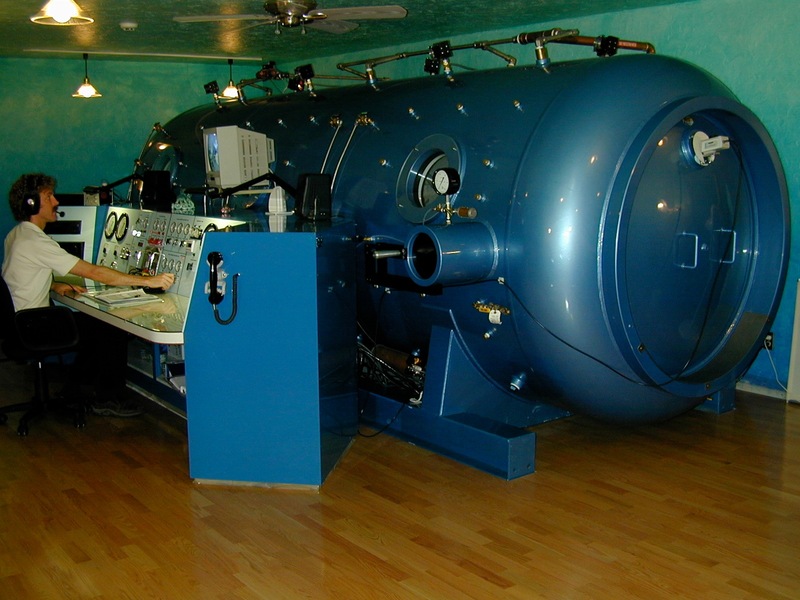 I am trying to induce healing and reduce inflammation, by applying hyperbaric principles to a normobaric situation. Currently I am prescribing 1/2-1 hr a day for my patients, and more during the worst moments as well. I am trying to get the highest doses I can with the equipment at hand. If there is something to suggest it is too much, then back off. It seems the dose may be high enough for a very few people to get a die-off, or “herx”. Hyperoxia creates free radicals, and free radicals kill bugs. If this happened to one of my patients, I would back down, but not off. But, even with added pressure, treatment with 100% O2 by non rebreather mask at 1.3 ATA would take many, many hours of constant exposure to cause oxygen toxicity severe enough to induce a seizure in a non-epileptic person. Wireless technologies overwhelm all the signalling comprising biological processes . WiFi is breaking BOTH strands of DNA— deformity will begin to show in the next generation. WiFi radiation accumulates in the body , like heavy metals. Diabetes Type 3 is caused by wireless technology. Another Samuel; could get confusing. Dr Jamie thank you for the wi fi info, that isn’t actually what I asked. Do you check the Transcutaneous Blood Gases before giving someone oxygen they may not actually need? With respect, yes or no would have been fine. Just read the blog again, I think by what you say in this paragraph, the answer is no you do not check, it is up to the patient to tell you if it makes them feel better or worse. I am not criticising you, I have seen this treatment used but NEVER blindly, that is the point I am making. That wasn’t Jamie answering about the wifi, that was a comment by someone else. Answered your first question above, Clare. This is an important point. Let me know if it still isn’t clear. Many thanks for your great blog and sharing all of this info. I’ve been looking into hiring an oxygen concentrator here in the UK (am mainly confined to bed). So far I have a quote back from one place, fairly expensive, and they say the concentrator offers up to 500L.min. This sounds very high from the figures you quoted. I appreciate you are busy but may I ask what doses of normobaric oxygen you are using in your clinic? Something is wrong with the units. 5L/min? Maybe you misheard. I’d check back and ask for clarification. I am using 5-10L/min for a half hour to an hour a day for home use, but most people manage it only 4 or 5 times a week, or even less and still are finding it helps. I am also starting to see declining use with improvement, even in people who responded very obviously at the beginning, and it seems to me that the sickest people are most likely to feel it tangibly. Also if used during an attack, migraine, palpitations, abdominal cramps, Raynaud’s, it is very useful. It makes people sleepy, so before bed is a good time to do it. Thanks for your reply. Yes, the woman from the company got back to me and apologised for writing 500L/min as opposed to 5L/min! Thought it sounded off…. This company only offers concentrators with flow of up to 5L/min. I was disappointed too at how expensive it is, £400.00 ($637) per month to hire and that doesn’t include tax which is around 20%. This is more than i can afford. It is the first company I came across so I will research some more. Would 5l/min be worth doing, as i know from your previous blogs your daughter used 10L/min and your aim is to get as high as possible if not able to use a chamber. Ah, sorry, somehow missed your second paragraph, so you answered my question about whether 5L/min would be of any use. I take it when you say you are seeing declining use after a time this is not because the oxygen treatment stops working, just that as the person is improving they don’t need to use it as much or frequently to get some benefit? Yes, I meant that people tend to get a bit lazy when they start feeling a little better (like me:). But they still reach for it during the bad moments, and that’s when it helps the most obviously. When you are feeling ok, it becomes work to do it. Even though there’s not much to it, it’s noisy and you have to wear the mask. However, at least for me, Ali and a few others, after overdoing, an hour of O2 prevents PEM. And then there’s the long term effect, slow, but stabilizing over time. Not everyone maybe, but enough to make it worth a try. Excellent risk/benefit ratio. I am going to give buying an oxygen concentrator some serious thought, as it sounds something that could benefit greatly…..
That seems crazy expensive, Annabel. In the states, they run $150-$400/month. Tanks are much cheaper, but have to be changed out fairly often. Oxygen is regulated like a drug in the US, but laws vary country to country. I am unfamiliar with the laws in your country, but my understanding is that your hyperbaric trust, charity chambers, don’t require a prescription. Here a new concentrator requires a prescription. In some places, you can just go buy one. They are available used sometimes. 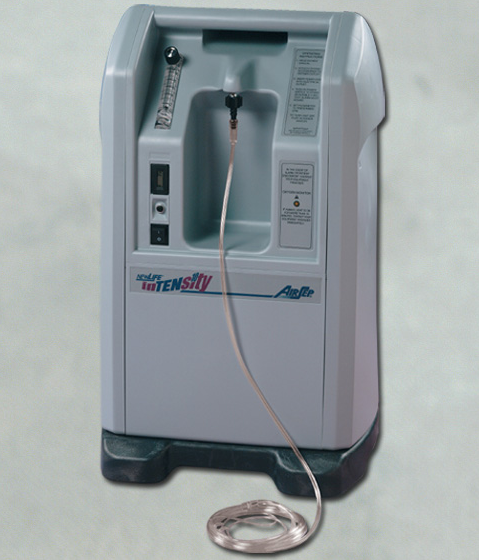 I have a patient who bought a used 5L/min concentrator for $200. Hi Jamie, yes, it is crazy expensive, but so far that is the price i keep getting quoted to rent. i could buy a concentrator at 5L/min for £700.00, so so far renting is not proving a financially feasible option. Does a rental require a prescription in the UK? About $1200 is the price of a new 10L/min concentrator here. I have one patient who bought a refurbished one for $900. Thanks for writing this article! What a timely blessing it has been for me. 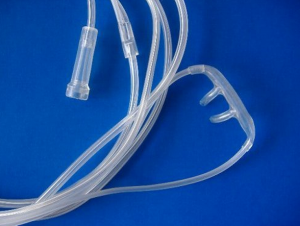 I have a concentrator at home which I use with a cannula throughout the night. I qualified for Medicare because my oxygen consumption was 88% for 11 minutes using pulse oxometry. The concentrator is set at 2 L/min. A sleep study ordered by my cardiologist revealed the problem. The symptoms which prompted him to have a sleep study done are morning headaches, abominable mornings where the word “fog” can’t begin to describe them, generalized weakness, and cognition problems. I will definately have him read your blog. I just completed my 5th night and so far, so good. No headaches, MUCH better mornings. Of course, I need more time to make any real connection to the oxygen, and I hope I show improvement in other areas. Improved cognition would be great. I didn’t read anything in your blog about using oxygen all night as I’ve been prescribed. 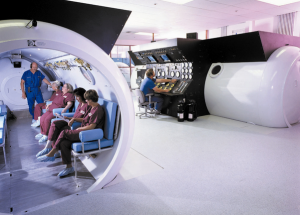 How long do you have your patients use oxygen? What about my settings on the concentrator? Is this appropriate? Thanks so much! You have and still are doing a wonderful thing for the CFS population. 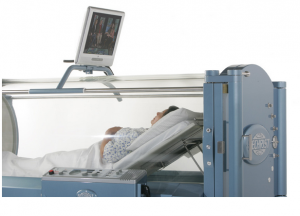 Sleeping all night with low-flow oxygen to prevent desaturation during sleep is a different treatment, but I am hearing from people who are improving from this as well, with our without CPAP. This is a more obvious problem and physicians recognize home O2 as a good idea for this indication. What I am doing with pulsed high dosed oxygen is unfamiliar to most doctors. I would use pressure if I could, but pulsing oxygen with a high flow concentrator and a non rebreather mask is the highest pO2 I can get without a chamber. Oops! Yes thank you Lilly! I should’ve checked that. I presumed someone answering a direct question to Jamie would have been Jamie! I will check twice next time. Thank you for pointing it out. I found this article written in 2006 in the UK Action for M.E’s magazine, Interaction, about oxygen therapy and M.E. I thought it might be of some interest. Interesting. My comments would take a whole ‘nother blog:). Thank you for posting. Glad it was of some interest – although don’t want to generate more work for you in response ;-). Am sure there are comments in it that could be robustly challenged. It was interesting though that it did help some of those who gave it a good try…. For ME/CFS patients, the energy expended on getting the treatment is always an issue. 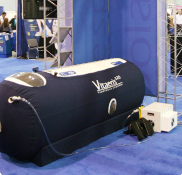 My guess is that experiences with HBOT in the UK would be better with a home concentrator as well. The UK is blessed with almost free HBOT centers all over the country, thanks to the work of a very special doctor, Philip James. They will treat all neurological indications, including ME. For MS, they usually start with lots of treatments for a few weeks, then go to maintenance. For us, I’d probably try a concentrator first (like I did with K in the guest blog a few back). 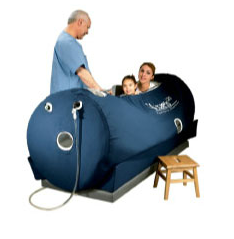 If clearly helpful, and once the patient’s body is used to some oxygen, HBOT might be even better. If so, maybe once per week? Start low, go slow is usually a good way to go for us. Thanks so much for this excellent and informative blog post. In the US, oxygen is regulated as a drug and requires a prescription. Can you please explain the benefits of a non-rebreather mask over a simple mask? 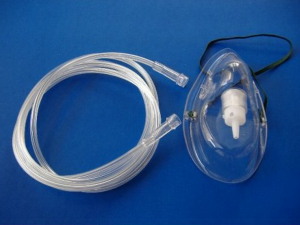 A “simple mask” came with the oxygen concentrator I bought last summer. Also, I do not understand how the term “non-rebreather” fits the mask in your picture. It would seem the exhalation being captured in the bag would cause one to re-breathe air they had exhaled. Thank you so much for all your help, Jamie! May i ask how you are finding the oxygen concentrator? Any benefits? No change? Yes, I get an energy lift after using it that adds an hour or two of activity to my day. Now, I’m trying it right after exertion to see if it prevents PEM like Dr Jamie experienced, and I think I have had fewer crashes and less down time. I’m sorry, I missed this and so didn’t answer sooner. A non rebreather mask has 95% oxygen in the reservoir, directly from the concentrator. 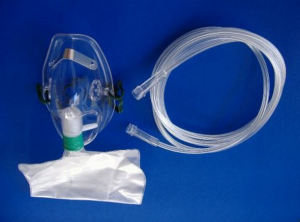 There is a one way valve at the top of the bag, bottom of the inside of the mask, that prevents exhaled gases from entering the bag. There are also one way valves on the outside of the sides of the mask that allow exhalation but not inhalation of room air. These valves get lost a lot and need to be kept track of for the mask to work properly. The mask only functions properly if the flow rates are high enough to keep from rebreathing CO2, requiring a 10L/min concentrator. Please do not use a non rebreather mask with a low flow concentrator. So I guess you need a prescription to breathe ? Sorry, just me with a lousy joke.